If you want to feel great and maximize your health, here is our nutritional powerhouse: flax that’s high in fiber, lignans, and Omega-3 fatty acids. Flax seed has been used in the diets of humans for thousands of years. The Babylonians cultivated flax seed as early as 3,000 B.C., and millennia later, in 650 B.C., Hippocrates used flax seed for the relief of intestinal discomfort. Flax seed was so important for the health of his subjects that the 8th century king, Charlemagne, passed laws and regulations governing its consumption. 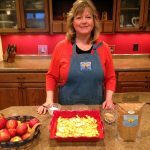 Today, consumers are turning to flax seed for its many health benefits and pleasant, nutty flavor a distinctive addition to baked products. flax seed provides essential nutrients, including protein, essential fatty acids, and vitamins and minerals; and it contains both soluble and insoluble dietary fiber. 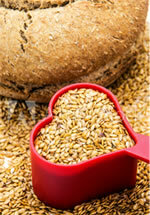 Moreover, flax seed is a rich source of lignans, a type of phytoestrogen. Phytoestrogens are compounds that may protect against certain types of cancer by interfering with the effects of estrogen. 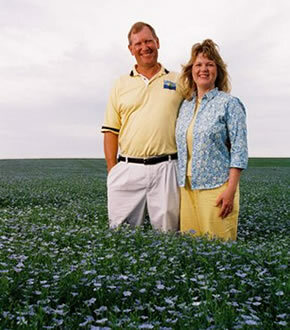 A North Dakota State University research project led to the development of a new golden variety of flax seed named Omega. 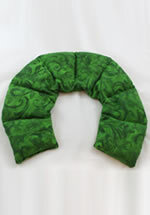 This new variety was created primarily as a human food source and Omega flax seed has a more pleasant nutty-buttery flavor than the brown flax. 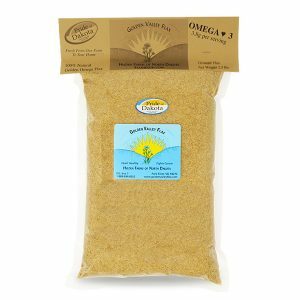 Omega flax seed was named for its higher level of omega-3 essential fatty acid found in the beneficial flax seed oil which is a higher percentage than the brown flax. 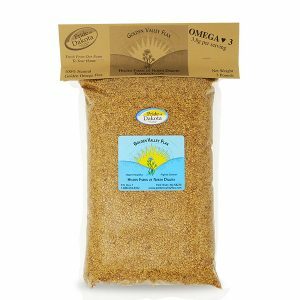 This golden flax seed also has a hull that is easier to grind and it looks much better than the brown flax seed when mixed into your favorite flax seed recipes. Sometimes, in our fast-paced lives, we tend to forget the simple pleasures of fresh homemade flax cookies, or the delicious smell of flax bread baking in the oven. In our constant quest for healthy eating and living, it’s important to remember the joy of preparing good food for those we love. 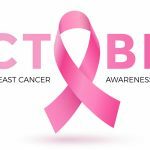 Football Players and Flax Go Pink | Breast Cancer Awareness Month- Football is just a game but it is being used to fight breast cancer. That is the real battle, not just a game. Fighting cancer is a fight for life itself. Read this medical study to see how flax can save your life. Thanks for your prompt service. 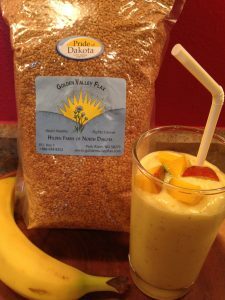 I had heard about flax’s health benefits, but had never tried any. Today I recommend flax to anyone with cholesterol problems. Now my doctor reminds me to stay on my flax. First off, let me say that you grow a wonderful flaxseed. I was first introduced to flax seed last July. My wife and I both now eat your flaxseed daily.